Robert George Seale 10/22/36 in Liberty,Texas. 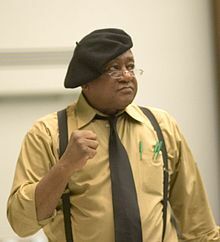 Co-founded the Black Panther Party for Self-Defense (BPP) with Huey Newton while they were both enrolled at Merritt Community College in Oakland, California. Dropped out of Berkeley High School to join the United States Air Force and was dishonorably discharged three years later for fighting. Adopted Malcolm X’s slogan for the BPP: “Freedom by any means necessary”. Was an original member of the Chicago Eight on trial for conspiracy, he was bound and gagged during the trial. Both Graham Nash and Gil Scott-Heron wrote songs about him. Ran for mayor of Oakland. Actor Carl Lumbly portrayed him in the HBO film. He also wrote an autobiography, A Lonely Rage and a cookbook, Barbeque’n with Bobby Seale: Hickory & Mesquite Recipes, the proceeds going to non-profit organizations. Currently my Facebook friend and is producing Seize the Time: The Eighth Defendant, a movie that about his experiences as a co-founding Chairman of the BPP.